After thrilling critics, proving 3D can be a worthwhile and wondrous storytelling device, and smashing box office records, how could How to Train Your Dragon go bigger for its sequel? Well, adding fantasy royalty to the cast is a great start. Director Dean DeBlois had the wise idea not only to bring Game of Thrones's Kit Harington into the mix, but also Cate Blanchett, the Aussie Oscar winner whose been a mesmerizing part of The Lord of the Rings and The Hobbit trilogies as the elf Galadriel. Her casting was announced last summer, but at long last we're getting a look at her character, and a bit of background courtesy of USA Today. Her name is Valka, and while Hiccup may think he's broken new ground in human-dragon relations, it's this reclusive lady who did it all first. Valka is a master Dragon Rider who lives in the Arctic and has been dedicating herself to setting dragons free from human snares and traps. She's even set up a hidden refugee camp for them there. 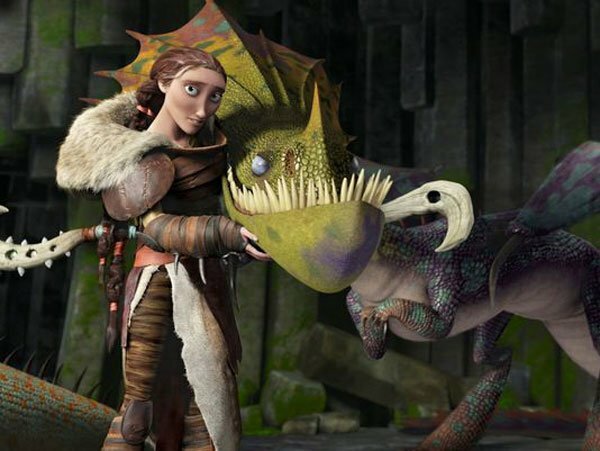 With How to Train Your Dragon 2 picking up five years after the first film, Valka proves a mentor--and potentially mother-figure--to the growing young hero Hiccup. While venturing away from his home of Berk, Hiccup not only meets Valka, but also the villainous dragon trappers she's fighting against, Drago Bludvist (Djimon Hounsou) and his second in command Eret (Kit Harington). In the picture up top, she's posing with a Hobblegrunt dragon called Gruff, but her closest friend--the Toothless to her Hiccup--is Cloudjumper, who has owl-like physicality and boasts a second set of wings that DeBlois explains "can actually splay and become an X-wing." We expect these two are just the tip of the iceberg on the new dragons the Arctic with offer when How to Train Your Dragon 2 touches down on June 13th, 2014. In the meantime, revisit this fascinating trailer that shows Hiccup and Toothless taking their tandem-flying act to new heights.